1. The Federations of England, Scotland & Wales will appoint a tri-federation committee comprising one delegate from each federation plus the Tournament Organiser. The committee will be responsible for the general supervision of the Championship and for the selection of players from the entrant’s subject to the provisions hereinafter contained. The Tournament Director(s) form part of the committee for consultation only and will not vote. 2. The Committee will appoint a Tournament Organiser by the first of May in each calendar year, to organise and run the tournament. 3. The Tournament Organiser will coordinate the preparation and release of appropriate materials to promote the tournament. 4. Competitors will play one game against each of the other competitors in the section. 5. All sections will commence and finish play inside two seasons, in accordance with Rule 8. 6. The championship will be open to any player who is born or is currently residing in the United Kingdom, a Crown Dependency or a British Overseas Territory or playing under an appropriate flag. Details of eligibility will be clearly stated at the time of entry. 7. The following rules will apply unless the Championship committee decides that special circumstances justify an alteration. The ICCF rating list (current at time of start of the event) will be used to rank the players in order, and place them into sections appropriate to their rating subject to Rule 7.1 and Rule 7.2 below. For players with no ICCF rating, National ratings will be considered by the Championship committee. a) A maximum of three players will be nominated by each of the home nations. The nominated players must all have an ICCF Rating above a figure laid down by the tri-federation committee. If sections 7.1b, 7.1c and 7.1d do not produce a player mix which enables an International Title Tournament then the players with the highest rating which will enable an International title tournament will be qualified prior to application of 7.1c and 7.1d. b) The winners and runners-up of the candidate’s section of the previous tournament will be entitled to enter. This entry cannot be deferred and must be used in the following season or it is void. who have scored at least +2 (i.e. 8 points in a 15-player Final; or 7 points in a 13-player Final or 6 points in a 11-player Final) will be entitled to re-enter. (This criteria may be reviewed in the case of withdrawals). d). All other players in rating order. a) The winner and runner up of each previous Reserve Section will be entitled to enter a Candidates' Section. b) The players who finished 3rd and 4th in the previous Candidates Section will be entitled to enter a Candidates Section. d) A maximum of three players will be nominated by each of the home nations. The nominated players must all have an ICCF Rating above a figure laid down by the tri-federation committee. If a federation is unable to nominate enough players the highest rated players from that federation will be considered nominated automatically. 8. The Championship Committee at its sole discretion will fill vacancies in the Championship or candidates' sections. Players will be placed by seeding, not by chance. 9. The Tournament Organiser will receive entries with entry fee by 1st September of each year. Nominations from all three federations must reach the Tournament organiser, with the entry fee, by 31 August at the latest of each year. Play will commence on 1st October and the adjudication date will be August 12th of the second year following. The ICCF adjudication procedure which is automated will be used to determine the outcome of unfinished games. 10. 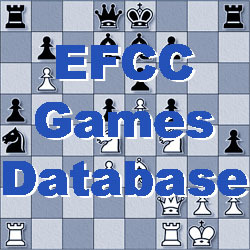 All sections of the competition will be played only via the ICCF web server (the server). The ICCF web server playing rules current at the start of the competition will apply, except as otherwise stated in these rules. 11. The time limit all sections will be 40 days for each 10 moves, with time doubling after 20 days. 12. The amount of leave all sections is 28 days per calendar year. (c) results of the tied players against each other. 14. Any matters concerning the organisation and running of the tournament not covered in these rules or the Playing Rules will be decided at the discretion of the Tournament Organiser. 15. Competitors may appeal against decisions of the Tournament Director via the ICCF appeals procedure. 16. The Committee reserves the right to decline an entry or entries.